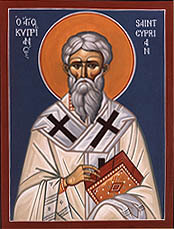 In the Catholic Church, both Latin and constituent Eastern churches, the act of canonization is reserved to the Apostolic See and occurs at the conclusion of a long process requiring extensive proof that the candidate for canonization lived and died in such an exemplary and holy way that they are worthy to be recognized as a saint. The Church's official recognition of sanctity implies that the person is now in Heaven and that they may be publicly invoked and mentioned officially in the liturgy of the Church, including in the Litany of the Saints. In the Catholic Church, canonization is a decree that allows universal veneration of the saint in the liturgy of the Roman Rite. For permission to venerate merely locally, only beatification is needed. In his De Servorum Dei beatificatione et de Beatorum canonizatione of five volumes the eminent canonist Prospero Lambertini (1675–1758), who later became Pope Benedict XIV, elaborated on the procedural norms of Pope Urban VIII's Apostolic letter Caelestis Hierusalem cives of 1634 and Decreta servanda in beatificatione et canonizatione Sanctorum of 1642, and on the conventional practice of the time. His work published from 1734 to 1738 governed the proceedings until 1917. The article "Beatification and canonization process in 1914" describes the procedures followed until the promulgation of the Codex of 1917. The substance of De Servorum Dei beatifιcatione et de Beatorum canonizatione was incorporated into the Codex Iuris Canonici (Code of Canon Law) of 1917, which governed until the promulgation of the revised Codex Iuris Canonici in 1983 by Pope John Paul II. Prior to promulgation of the revised Codex in 1983, Bl. Pope Paul VI initiated a simplification of the procedures. "Servant of God" ("Servus Dei"): The process of canonization commences at the diocesan level. A bishop with jurisdiction, usually the bishop of the place where the candidate died or is buried, although another ordinary can be given this authority, gives permission to open an investigation into the virtues of the individual in response to a petition of members of the faithful, either actually or pro forma. This investigation usually commences no sooner than five years after the death of the person being investigated. The Pope, qua Bishop of Rome, may also open a process and has the authority to waive the waiting period of five years, e. g., as was done for St. Teresa of Calcutta by Pope John Paul II, and for Lúcia Santos and for Pope John Paul II himself by Pope Benedict XVI. Normally, an association to promote the cause of the candidate is instituted, an exhaustive search of the candidate's writings, speeches, and sermons is undertaken, a detailed biography is written, and eyewitness accounts are collected. 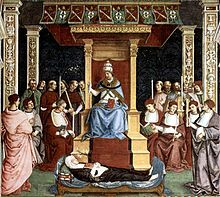 When sufficient evidence has been collected, the local bishop presents the investigation of the candidate, who is titled "Servant of God" (Latin: "Servus Dei"), to the Congregation for the Causes of the Saints of the Roman Curia, where the cause is assigned a postulator, whose office is to collect further evidence of the life of the Servant of God. Religious orders that regularly deal with the Congregation often designate their own Postulator General. At some time, permission is then granted for the body of the Servant of God to be exhumed and examined. A certification "non-cultus" is made that no superstitious or heretical worship, or improper cult of the Servant of God or his tomb has emerged, and relics are taken and preserved. Popes have several times permitted to the universal Church, without executing the ordinary judicial process of canonization described above, the veneration as a saint, the "cultus" of one long venerated as such locally. This act of a pope is denominated "equipollent" or "equivalent canonization" and "confirmation of cultus". According to the rules Pope Benedict XIV (regnat 17 August 1740 – 3 May 1758) instituted, there are three conditions for an equipollent canonization: (1) existence of an ancient cultus of the person, (2) a general and constant attestation to the virtues or martyrdom of the person by credible historians, and (3) uninterrupted fame of the person as a worker of miracles. ^ Aimable Musoni, "Saints without Borders", pp. 9–10. ^ "Sister Lucia's Beatification Process to Begin". ZENIT – The World Seen from Rome. Archived from the original on 27 September 2012. Retrieved 4 October 2014. ^ Davlashyan, Naira. "Armenian Church makes saints of 1.5 million genocide victims – Yahoo News". News.yahoo.com. Retrieved 23 April 2015. ^ "Armenian Genocide victims canonized in Holy Etchmiadzin". Panarmenian.Net. Retrieved 23 April 2015. ^ "Canonized: Armenian Church proclaims collective martyrdom of Genocide victims – Genocide". ArmeniaNow.com. Retrieved 23 April 2015. This page was last edited on 16 April 2019, at 14:10 (UTC).